Many points in this piece doesn’t necessarily reflect our views. But we still think it’s an interesting read – A response to the comments and criticisms of our article “Autonomism: Cutting the Ground From Under Marxism“. 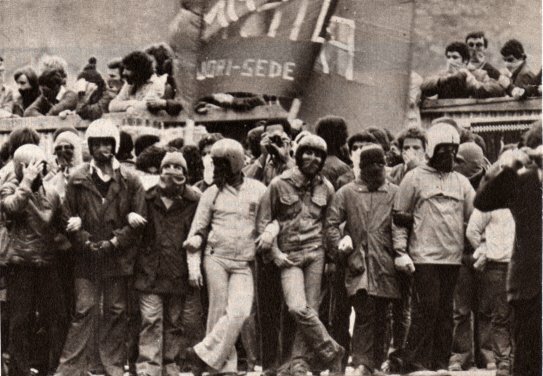 The article from Revolutionary Perspectives 10 Autonomism – Cutting the Ground from under Marxism” has attracted quite a lot of comment and criticism. The text was not an historical treatment of the development of Autonomism, which we recognised was a heterogeneous movement extending over a period of almost two decades. It was intended to show, by looking at four elements of Autonomist theory, how theoretical errors had led the movement into a cul-de-sac. However, we recognise that some of the general comments made in the introduction are too categorical and were historically inaccurate. We are grateful for corrections of fact and for further information which has been provided, in particular by the comrades of Mouvement Communiste. In addition the text has been criticised for its failure to highlight the organisation and methods of struggle which the Autonomists used in their struggles with capital. These are strategies of struggle which the ICT largely supports and which we consider are key to successful class struggle today. Although this was not the focus of the previous text we recognise that this is the most important legacy of the Autonomists period which should be more widely known. We will review this below together with the question of the formation of the party. We wish first, however, to reiterate our criticism of the general political thrust of the Autonomist movement which was not stated strongly enough in the previous text. Our critics have pointed out that various sections of the movement did form political organisations contrary to the assertion in the text that the movement did not form a political organisation. The text’s statement was incorrect and should have been qualified to say that no single organisation was formed and those which were formed did not survive the 1970s.3 However, for us the key point, which was made in the text, was that the organisations which were formed did not break from the politics of the capitalist left and consequently could not give the movement a coherent anti-capitalist direction. PO also, as we mentioned in the previous text, urged workers to support national liberation struggles which amounts to submitting the interests of the working class to the interests of the national bourgeoisie. LC called for voting for the PCI in regional elections in 1975 and together with AO joined an electoral coalition, Democrazia Proletaria 5, in 1976. Later both organisations called for voting for the PCI in national elections. The call for voting for the PCI in national elections was launched after the so-called “historic compromise” or democratic alliance of the PCI with the Christian Democrats in 1976. In the so-called Salerno Turn he announced that the PCI would work with anti-fascist capitalist parties and monarchists to implement this, and did so by participating in all the Italian governments from 1944 to 1947. Those who supported the path of revolutionary communism found themselves trapped between the fascist police on the one hand and the bullets of the PCI on the other. The CWO’s sister party in the ICT, the Partito Comunista Internazionalista (PCInt), known by its paper Battaglia Comunista, which was formed in 1943, found itself in this position. Rejected the lie of national roads to socialism.10 The PCI now announced there was a parliamentary route to socialism. For this the PCI slandered the PCInt comrades branding them as agents of the Gestapo and launched a manhunt against them. In 1945 two PCint comrades were murdered by PCI assassins and other comrades “disappeared” all on the orders of PCI leaders.11 Meanwhile fascists were freed from prison and granted amnesty on the orders of the new Minister of Justice, who just happened to be the leader of the PCI, Togliatti. We mention this sorry history today only to restate that any political way forward for the working class must entail a total break with the political forces of capitalism which is what the PCI and the PSI and their various offshoots represent. Sadly the political forces emerging from the Autonomist movement did not make this break and led the movement into a dead end. The valuable legacy of the movement for today is in the forms of struggle it initiated. Autonomist struggles were conducted by works committees that operated outside the official trade unions and independent of the CPI and PSI. Where there were many factories or branches of an industry in an area works committees were federated and in some regions, e.g. Porto Marghera12, an Autonomous assembly was formed. The purpose of this assembly was to coordinate workers struggles both inside and outside the factories. The assemblies became points of reference for other social struggles. In many areas assemblies were supported by students. In Turin, for example, there was a worker/student assembly grouping 1500 workers. Such organisation generated a tremendous social energy and solidarity with the potential to grow into a massive social movement. equality of treatment for permanent and temporary workers. reduction in housing rents and occupation of empty housing. In certain areas workers paid only what they considered a fair price for these things and in some areas these self-reductions were made official. In the province of Venice in 1974, for example, after 4 months of self-reduction of electricity bills, an official agreement to reduce the price of electricity was reached. Needless to say, the capitalist class was busy preparing and implementing counter measures. The first was the restructuring of production. The number of workers needed in industry was reduced by replacing workers with robots. The time to produce a car at Fiat, for example, halved between 1973 and 1979. Large concentrations of workers were broken up and production started to be shifted to peripheral countries. The giant chemical factories, which were at the heart of the struggles at Porto Marghera, are today mostly empty shells. The final blow was delivered by the state repression. As mentioned above the actions of the Red Brigades gave the state the pretext it needed, and large numbers of Autonomist militants were charged with supporting terrorism, arrested and imprisoned. This was in effect the crushing of the movement. Until the revolution succeeds the only real gains the working class can make from its struggles against capitalism are in its ability to organise itself and its consciousness of the necessity and the means to overthrow capitalism. The gains in consciousness need to be made through reflection and analysis of the problems and development of the capitalist system, workers’ struggles against it, the advances and mistakes and the way forward on a global scale. This process is one which entails a dialectical interaction of theory and practice but generally needs to be carried out outside the physical boundaries of the struggle by those prepared to devote their abilities to it. It needs to be developed within a political party which groups those who understand the need to establish communism and the need to develop the theory and practice to achieve this. Can the political party be formed from the struggle organisations? While it is true that LC emerged from the struggles of 1968-69 it was not simply a unitary organisation but a political one. A more general statement of this thesis is that the economic unitary organisation will create the political organisation. But the political nature of the organisation the struggle creates is key. As we have attempted to show above, the organisations, such as LC, which emerged from the struggles of this period, emerged with social democratic consciousness, which led back to bourgeois electoral politics and the cul-de-sac of reformism. However, when the US entered the war, the IWW regarded the war as simply an interruption to building the organisation. It gave no political direction to its sections and left it up to each section to decide its attitude to the war. One of the most militant sections at the Philadelphia docks, which had carried out a massive and successful strike in 1913 21 saw hundreds of its members sign up for the military, and agreed a no-strike pact at the port for the duration of the war.22 This is another illustration of the need for a clear political organisation which is able to give a political lead in times of crisis. It also shows the failure of attempts to give the economic struggle precedence over the political struggle. In our fight for communism we have constantly raised the issue of the International, or International Party. Unless the world working class forges this political tool as part of the rise of its revolutionary consciousness we will be facing yet more defeats in the future. Can the party be formed at the present time? According to the World Bank there are now 3.45bn workers in the world who, together with their children, represent the majority of the world’s 7.6bn population. This means that the situation we face is entirely different from that faced in 1917 when the majority of the world’s population was peasantry. The revolutionary wave which followed World War One was broken and dissipated on the rocks of the peasantry. The changes in global class composition mean that today the opposition of the peasantry to communism is no longer a threat. The situation is consequently more favourable to the successful overthrow of global capitalism. In the present period we are seeing the formation of a world working class even though it does not understand itself as the force to overthrow capitalism. Capital, by globalising itself more completely than ever before is globalising its contradictions and its internal problems. It is globalising its exploited and its exploiters and producing impoverishment of its global working class. All these processes are, however, far from compete and the full contradictions of the system on a global scale have not yet been fully developed. Nevertheless the world’s workers are struggling in an elemental and increasingly bitter way against capital despite the divisions of nationality, of race or religion which the capitalist class does not hesitate to engender and support. These struggles give us hope for the future. However their fragmented nature has led some to argue that the time for the formation of a global party is not yet. New forms of labour organisation and political struggle appropriate to the scale of globalisation we have now achieved, need to develop before the party can be built. Though it may be true that an international party cannot be built in the present period, a nucleus of such a party can be built today. The economic crisis of 2007/2008 was an indication of the seriousness of the economic problems capitalism is facing and the real possibility of either a social collapse or a future war. A social breakdown, however, will not on its own lead to communism, despite the dreams of the communisation tendency. Communism can only come about if there is a global organisation fighting for it and fighting for a programme to achieve it. The crisis of 2007/8 has generally shaken confidence in the system and building the skeleton of such an organisation is both possible and urgent today. 3.Potere Operaia collapsed in 1973, Lotta Continua in 1976 and Avanguardia Operaia in 1978. 5.This coalition included a spin off from the Italian Socialist Party (PSIUP) and a Maoist group. 6.Confederazione Generale Italiana del Lavoro. The largest Italian trade union. 8.G. Sbrogio, a militant from Porto Marghera autonomous assembly spent 4 years and 8 months in gaol accused of being the brains behind the Red Brigades. This is just one example of many workers who were falsely imprisoned by the state. Their real “crime” was fighting for working class interests and so threatening capitalist exploitation. 13.This is the assessment of PCInt. 14.This is articulated by Emanuela Furlanetto who participated in the self-imposed food price reductions. See the video “The Suspended Years” available from Mouvement Communiste. For more on Gramsci see leftcom.org. We will be publishing a translation of Onorato Damen’s Gramsci: Between Marxism and Idealism later this year. 15.COBAS acronym for Comitati di Base, or rank and file unions. 17.The Angry Workers of the World (AWW) and Mouvement Communiste support this position. 19.AAUD-E was the General Workers Union – unitary organisation. 22.This did not, of course, prevent the bourgeoisie from attacking the organisation, smashing its offices and imprisoning its leaders for terms of sometimes 10 to 20 years. IWW members were branded as first as spies of the Kaiser and later after October 1917 spies for the Bolsheviks!